Herschel is a huge crater in the leading hemisphere of the Saturnian moon Mimas, on the equator. It is the one that makes Mimas look like The Death Star. 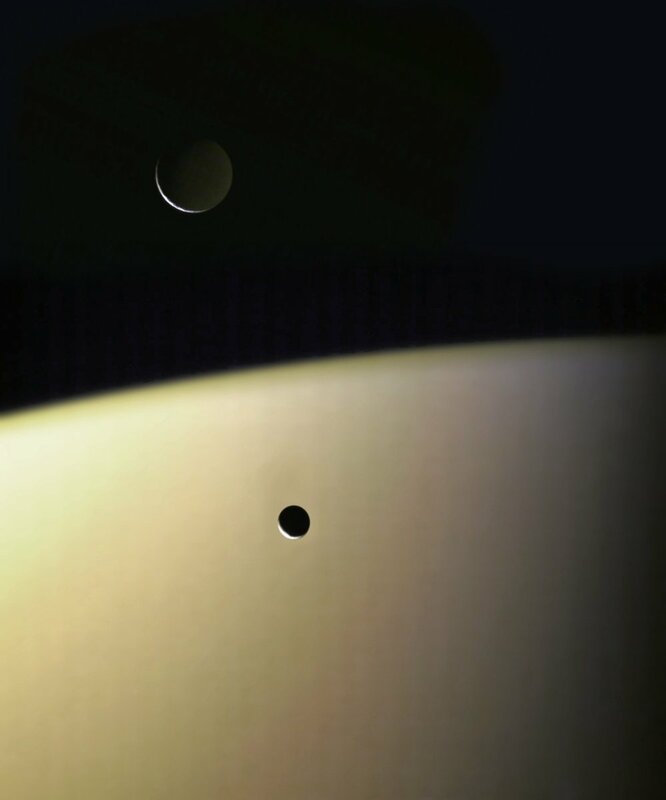 This is the best image yet of this feature taken by the Cassini probe. The Saturnian moon Mimas wanders into the frame of this shot which was primarily observing the active geysers on Enceladus. Commonly known by most as that “Death Star Moon” — Mimas, is seen here in the some of the finest detail ever (and seen here in sick detail). Flying to within 9,500 kilometers (5,900 miles) of the moon, Cassini captured the infamous Herschel Crater dead center in the still frame. Herschel, a feature which upon its originating impact, likely came close to shattering the tiny moon into another Saturnian ring. The image itself is a mosaic of several high-resolution images carefully placed together to make a full disc image. The lower right hand corner segment is (sadly) in a much lower resolution than the rest, but I’ll bet you didn’t even notice until I pointed it out and ruined it for you. The King of Saturn imagery does it again. One of the key images that inspired me to even start this blog was the NASA officially produced image of Mimas against ring shadows. This one is pretty much just as stunning. Gordan has knocked out a few other Saturn images recently, all worth a look at his flickr stream. Here is a recent set of raw Saturn images (red, green and blue filters) combined to create a near-true color shot. Of course, the moons and Cassini were both moving and changing the perspective of the 3 bodies from one another from one filtered exposure to the next (the effects of which can be seen at left). So it was required that the 2 moons be “lifted” from the main image, properly registered for each individual moon and then merged back into the main composition. Once in place, a bit of Photoshop retouching was needed to erase the echoes in the 2 other channels where the moons were before registration was corrected. The raw files archive on the Cassini site only reports which object was targeted, so it did not specify that the other moon is Mimas… but I cannot image what other globe that could possibly be seemingly inside Enceladus’s orbit. One of my favorite wallpaper images from the Cassini mission. This image almost looks like one of the fantastic Chesley Bonestell images from the 80’s only its not a painting. What you see are Saturn’s rings along the bottom and tiny Mimas floating across Saturnian cloudtops which are being shadowed by the rings. It is thought that these deep shadows, in addition to Saturn currently being in winter, somehow cause less clouds to form in Saturn’s northern hemisphere and create the blueish appearance seen here. When the Voyager’s passed by Saturn in the 80’s the entire globe appeared to be peach colored and lacked any of the blues you see today. IMAGE NOTE: The left 1/5 of the image (the rings) is a digital extension of the image data found near the edge of the original image. This was done simply to fill out the proportion as the original was cropped to about 4/5 the the width. In 1977 George Lucas released Star Wars and in it was featured the now infamous Death Star space station which was justly destroyed in the films final scene. That same year Voyager 1 was launched from Earth on its way to the outer solar system. On its way through the Saturnian system it relayed back images of a moon that bore a striking resemblance to Lucas’s own vision of the Death Star. The only feature that really makes the resemblance complete is the presence of the Herschel crater which, like the Death Star, occupies almost 1/3 the moon’s own diameter. The central peak, which often occurs on larger sized impacts, also makes for a good stand in for the giant laser turret that destroys planets. With results of the Voyager mission streaming in a few years after the film became a smash hit and just a few months after the release of “Empire Strikes Back” one has to wonder if anyone at mission control uttered the words, “That’s no moon”. However, while the circular feature on the Death Star destroys other worlds, Mimas’s giant circular feature nearly destroyed its own self. The crater is so large in comparison to the size of the moon itself it is believed that it was quite close to shattering the small moon into many bits which maybe could have resulted in even more rings for Saturn. As it is there are fractures on the opposite side of the moon which some suggest may be stress lines from that same impact and show evidence that the moon did start to become unhinged. Proportional to the size of the body itself, this is the largest crater in the Solar System with only Mars’s moon Phobos coming close with its Stickney crater. In one of Cassini’s more surreal images, the small moon Mimas is seen floating across the ring shadows cast upon Saturn’s cloud-tops. Mimas is a rocky 400km moon whose most notable feature is a 130km crater that dominates its appearance. IMAGE NOTE: The original image was close to a square cropping, so a large part of the 1/3 left of the image (which is mostly black space) has been extended using data from the rest of the image to duplicate details and fill out the dimensions. The rest is the real deal.